Protests in Zimbabwe over a fuel price hike entered the third and final planned day Wednesday, with police arresting a pastor accused of inciting violence via social media. Early Wednesday, armed police surrounded the home of Pastor Evan Mawarire before arresting him for helping organize a three-day stay at home strike to protest Zimbabwe's 150 percent fuel hike. 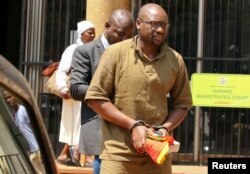 Pastor Evan Mawarire is escorted by detectives as he arrives at court to face charges of attempting to subvert the government, in Harare, Zimbabwe, Sept. 26, 2017. NGOs and opposition parties, meanwhile, are accusing the police and army of assaulting protesters. According to a doctors group, 68 Zimbabweans have been treated for gunshot wounds, with 17 undergoing emergency surgery, after protests this week over a steep rise in the price of fuel, the group said Thursday. ​Attorney Beatrice Mtetwa of Zimbabwe Lawyers for Human Rights is representing Mawarire. "They are alleging that he incited violence through Twitter and other forms of social media. We have asked for full particulars — when, how. They said they do not know,” Mtetwa said. “They will give him [details] at the police station. We have asked how asking people to stay away constitutes inciting into violence. Of course, this is the new dispensation, guys." On Tuesday, the government said a policeman was killed when demonstrations began Monday. It accused the protesters of "terrorism acts" which included looting and setting fire to property and vehicles, mainly government owned. Zimbabwe's main opposition said it was actually the army and police assaulting protesters. MDC spokesman Jacob Mafume: "It is everyone's right under the Zimbabwe's constitution and Universal Declaration of Human Rights to be able to express themselves in any manner they see fit. We ask the security forces not to be excessive in their response to the people exercising their freedom. Loss of life at all costs. The solution is there, the solution is dialogue. We notice that there has been a shutdown in terms of internet communication, that needs to be opened." Zimbabwean authorities shutdown internet access Tuesday, saying citizens were using social media to spread malicious information about the strike that turned violent on its first day. President Emmerson Mnangagwa is in Russia as part of his five-nation visit that ends by attending the World Economic Forum next week in Davos, Switzerland. Before leaving, he dismissed opposition allegations that the trip was just a jaunt. "My visit to the first four nations will enhance bilateral relations with our policy of engagement,” Mnangagwa said. “My visit this time around, will focus, predominantly, on bilateral economic engagements especially in areas of mining, technology, agriculture, energy and human capital among others." On Wednesday, more than 200 protesters were brought to court and more are expected Thursday to face charges of violence. Mnangagwa shocked many when he announced the fuel price increase, a task legally done by the Zimbabwe Energy Regulatory Agency in consultation with the energy minister. The government says the 150 percent fuel hike is meant to ensure the country is able to import adequate supplies of the commodity that has been in acute shortage for months.